After meeting up with your group, you’ll start off on your approximately 2.5-hour walk around the city. Your route will vary, but will take in many of the major Florentine points of interest—including The Duomo, the Palazzo Vecchio and Uffizi Gallery, the Baptistery of San Giovanni with its “Gates of Paradise”, Giotto’s Campanile, Brunelleschi’s Dome, the churches of Santa Trinita and Orsanmichele, the Ponte Vecchio, and the secret Vasari Corridor. 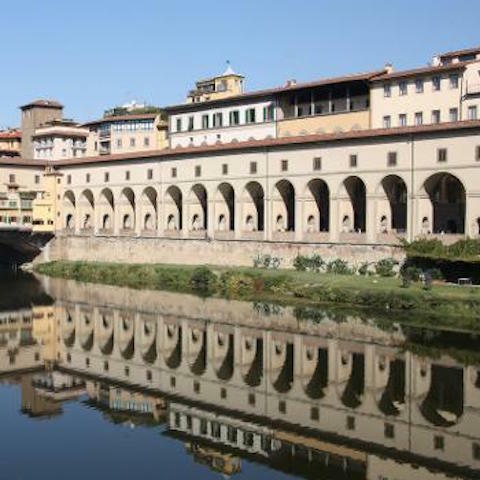 Along the way, your guide will share with you the fascinating history behind these landmarks—with a special emphasis on the prominent and powerful Medici family, whose wealth and influence over centuries helped shape the city into the cultural and artistic hub it still is today. You'll finish your tour with a traditional aperitivo to welcome you to the city.